Taste the Difference in Your Cup: AmoVee stainless steel coffee maker is double-insulated to keep your coffee or tea at optimal drinking temperature for much longer. Brew a cup of fresh and smooth coffee with an incredible aroma by AmoVee french press. Try It Risk Free: Made of sterling 304 food-grade stainless steel, with mirror finish outside and brushed finish inside. No risk of cracks or breakage. It is well-made and designed to outlast other coffee makers. Right for You: Double-layer mesh ensures a cup of clean coffee for you. Add your coarse ground coffee or loose tea leaves, hot water and press. As you push down on the plunger, the press filters out the coffee grounds, producing a full-bodied brew. Note: Wash the stainless steel with vinegar or club soda before first use is recommended. Two Bonuses: Comes with an espresso spoon and extra filter screen. Stir your coffee and enjoy the moment by this easy brewing. 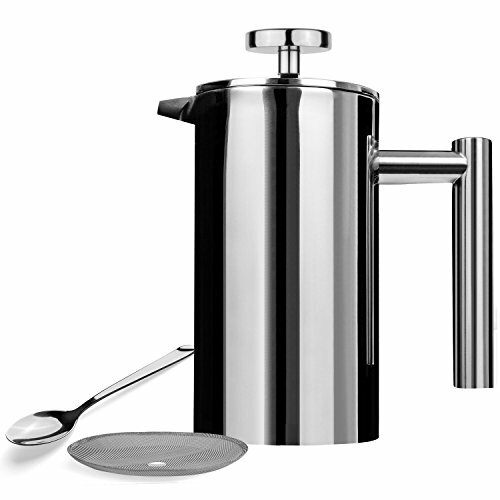 AmoVee stainless steel french press perfectly combines beauty as well as functions. Best Choice for Gift: All parts are easily disassemble and dishwasher-safe. The capacity of AmoVee French Press is 12 OUNCE/ 350ML. It is certainly a best gift for all coffee lovers. Just click "Add to Cart". If you have any questions about this product by AmoVee, contact us by completing and submitting the form below. If you are looking for a specif part number, please include it with your message.